September 2008 – Adrienne W.
I started in 1997 when I left full time work and saw an embossing demo at a local mall. I found the nearest store and took classes…..need I say more! I’d have to say layering, if that’s a technique, but I have tried just about everything and am ‘jack of all trades, master of none’! No real favorite, but I do love the Penny Black Brush Strokes and Imperial Cargo. Oh, all and any! I have lots of Art Neko and a good selection of odd bods as they take my fancy. 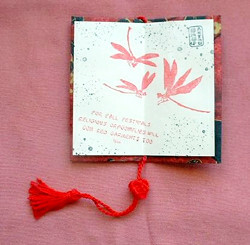 I prefer leaves and flowers; quotes and objects [lanterns, fans etc] but use all the stamps I have. Papers, papers, papers! I admit to being addicted – lol! Red, black and gold/white mostly, although I’m trying to use purples, blues and greens. 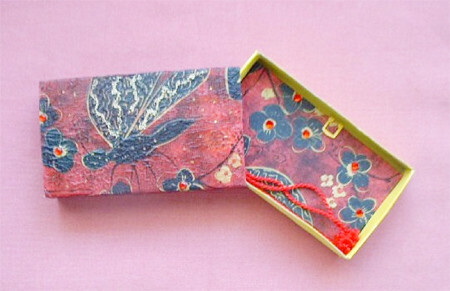 I love vellum with a printed quote, if appropriate, punched gingko leaves or flowers and bug charms, especially dragonflies. My tweezers! [and personal cutter] My fingers are so disobedient a tool is a must! Make use of the many resources OSA has and never be afraid to ask anything of our wonderful group. Someone will know and everyone is so sharing. Simple, clean and elegant, with so much versatility, be it intricate or simple. I believe Portland would be a great place to start, although I’m not in a position to travel nowadays, like I used to. Fortunately there are some great online stores to shop at and I do take advantage of these. I have belonged to an Aussie Yahoo group called Stamphappy for 10 years; I also dabble in an ATC swap group and run a small arty internet group. Along with a couple of friends, I attend monthly club meetings, where we have projects, classes and raise funds for charity, through an annual Stamp-a-thon. I used to love Inspirations and a friend lends me Take Ten, but I also subscribe to VSN, which has just recently been made available here. Of course my most thumbed magazine is “Return To Asia” which I just adore. Not that I know of, apart from Thursday tips in VSN. My hobbies include photography, music, reading, the out doors, gardening. I don’t have a talent, that I’m aware of! Magazines, new stamps/papers, other OSA stampers & blogs. Not me, but my Dad dabbled in oils, Mum was a talented pencil artist and our eldest daughter uses pastels and chalks as her medium. I always enjoyed writing and coloring, but never took it further. Household washers and rubber bands! Not in Oriental, I have to say! Too many, but number one is OrientalStampArt.com and there are arty blogs I frequent on a regular basis. No, I retired 11 years ago. I’m originally from New Zealand and we moved to Brisbane, Australia 20 years ago. We live in the suburbs about 25 minutes from the city. One adult daughter lives in Victoria [a southern state] the other about 20 minutes away from us. At the time of writing we are planning to sell our house and take a ‘sea change’ and retire by the beach. I have a cockatiel called Blue, who oversees my stamping and helps with decorative edgings! Our yard is full of colorful birds and tropical greenery, although the drought has taken its toll. Usual tools — ruler, scorer, scissors etc. Paint the tray of the matchbox and set aside to dry. Choose paper and paste box lid all over with Liquitex or another gloss medium, cover with paper, and leave to thoroughly dry. 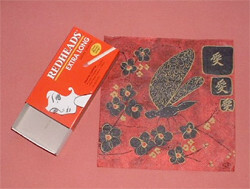 Cut a 4 ¼ “ by 4 “ [11cm x 10.3 cm] square from firm card. Score center and fold in half, then paste to the cut square of paper, cut 2cm wider than the card. Trim inside and miter the corners. 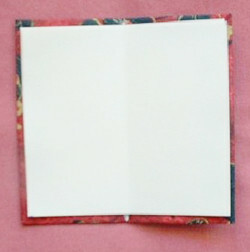 Cut a piece of plain paper to fit inside the cover, less about 1cm all round. 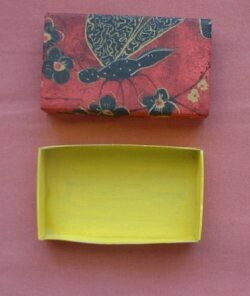 Stamp whatever you like on the inside, then fold in half and set aside. 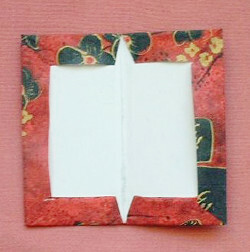 Choose threads or a tassel and lay that along the folded book cover and glue the page lightly in place over the top. 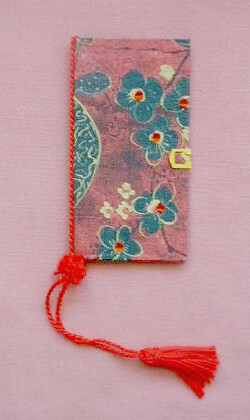 Decorate the cover – I used red sticky backed jewels in the center of the flowers and added a little metal clip to hold it closed. Place in the drawer of the box. Lastly, decorate the box top. I used jewels again and gold Beedz on the dragonfly wings.